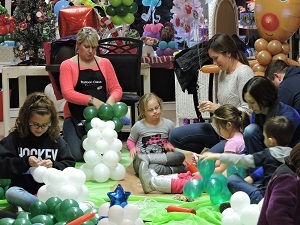 December marks the favorite month of the year for our Balloon Classes! Why? Well…..for many people, spending time OUTSIDE in this cold, blustery Chicago weather isn’t much fun so it’s time to check out the indoor activities instead! Plus, The holidays create many opportunities and ideas for class projects…..so CHEERS to December Balloon Fun! 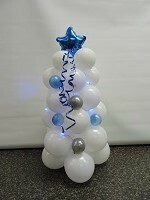 The Christmas Tree Balloon Class is taking place on TWO different occasions! Class is $10.00 and includes a Do It Yourself Kit for One Holiday Tree! There will be a SPECIAL GUEST…..Olaf! Children may pose with Olaf and adults may do so too! DID YOU KNOW??? PRIVATE PARTIES ARE AVAILABLE IN OUR STORE OR AT YOUR HOME. Call 219-322-7777 for more information. 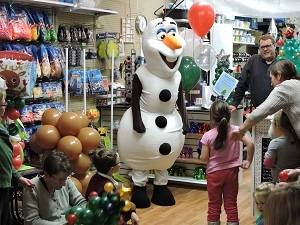 Invite Olaf and one of our Balloon Twisters into your house this Holiday Season!! 1. What are the ages? Pre-School through Middle School are all appropriate ages. WE ASK THAT PARENTS STAY if a child is in Kindergarten OR YOUNGER. Parents…..you may stay OR you may leave your children with us. Miss Amy is a former 3rd grade teacher. Your child is in good hands! 2. How long does the class last? Most classes are about an hour. However, if a class is unusually large…..it may run over for a few minutes. 3. Do I Need to Pre-Register? Pre-Registration IS recommended. When you pre-register, you guarantee your child a spot. However, Walk-Ins ARE WELCOME. 4. What do I have to do to book a private party? Call 219-322-7777 and speak to Amy about booking a private party. Spots fill up about one month in advance. WE RECOMMEND PRE-BOOKING YOUR PARTY. 1/2 is due at the time of booking. 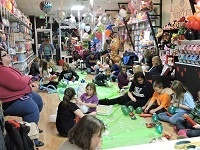 The remaining balance may be paid to the balloon twister or by calling the store prior to or on the date of the event. We accept Visa, Mastercard, Discover and American Express. If the party is at your home, We recommend setting a table up for the twister or instructor to use in order to lay out/organize their supplies. We ask that you please make sure that the children do not grab the supplies or OLAF. Travel Fee of $.56/mile will be added to jobs outside of Dyer. 5. What about Olaf? Please call the store to book Olaf! Olaf will come to your party. However, due to the fact that the person wearing the costume cannot see…..Olaf DOES require a “travel Partner!” THEREFORE…..we suggest having an Olaf Balloon Twisting Party! Olaf will arrive along with one of our employees who will twist Elsa/Anna balloons and/or snowman balloons. Have a Wonderful Winter, friends!! Call us to PLAN all of your parties! The big day is here. 6 Year Anniversary Open House and Celebration. Balloon Release at 3pm.